Prof. Salem Chouaib, Director – Thumbay Research Institute for Precision Medicine, completed his undergraduate studies at the University Pierre and Marie Curie (Paris VI) and Pasteur Institute (Paris). He received his PhD in immunology, (laboratory of Jean Dausset, Nobel prize in medicine) in 1983 and his higher doctorate (doctorat d etat es sciences) in 1986 from the same university. He joined the Memorial Sloan Kettering Cancer Center in New York where he undertook a post-doctoral training in Human Immunogenetics Laboratory. In 1986, he was appointed as a research associate at the French National Institute of Health and Biomedical Research (INSERM) and joined the tumor biology department at the Institut Gustave Roussy. For more than twenty years, he was leading an INSERM Research Unit (tumor immunology). His laboratory focused on the investigation of the functional cross-talk between cytotoxic cells and tumor targets in the context of tumor microenvironment complexity and plasticity. His research was constantly directed at impulsing the transfer of fundamental concepts in clinical application in particular in the field of cancer vaccine and cancer immunotherapy. Prof. Chouaib is a member of the American Association of Immunologists, New York Academy of Sciences, French Society of Immunologists, International Cytokine Society, American Association for Cancer Research, International Society for Biological Therapy of Cancer and American Association of Biological Chemistry. He was awarded the cancer research prize of the French league against cancer in 1992 and in 2004 the presidential prize in biotechnology. He was awarded for translational research and scientific excellency by INSERM. His research resulted in more than 310 scientific articles and several reviews in the field of human immunology, tumor biology and cancer immunotherapy as well as in editorship for contribution to several books. He is a member of several editorial boards. 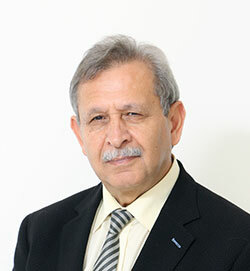 Prof. Chouaib has extensive administrative experience in different capacities as a member of the immunology section committee (National Institute for Health and Medical Research, INSERM, France); Member of the Scientific Advisory Committee of the French Ligue against Cancer; Member of Scientific Council, Gustave Roussy, Member of the Scientific Advisory Committee of the Research Association against Cancer (ARC); Member of the Scientific Council of the French National Cancer Plan; Member of the AFSAPS (French food and drug administration); Member of the Council “Studium of Molecular Medicine” International Doctorate School; Member of the International Council at Pasteur Institute (Tunisia); Member of Academy of sciences, letters and arts (Tunisia); Member of the Education Task Force of Cancer Core, Europe.